Please sign the UN Petition to the new President of the UN General Assembly for a Resolution establishing a United Nations Decade of Contact. We now have over 5000 signatures of individual citizens worldwide. At 10,000 signatures the Petition will be presented to H.E. 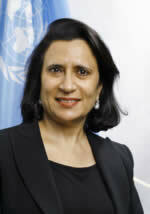 Sheikha Haya Rashed Al Khalifa President of the sixty-first session of the United Nations General Assembly. France and the U.K., both U.N. permanent Security Council Members, have now (in March & May 2007) become the first and second nations on Earth to open their secret Extraterrestrial craft files. H.E. Sheikha Haya Rashed Al Khalifa was elected President of the sixty-first session of the General Assembly on 8 June 2006. Sheikha Haya brings to the post a long and distinguished legal career at both the national and international levels, spanning three decades. One of the first two women to practise law in her country, she has held many senior positions with leading legal organizations of the world including the International Bar Association, where from 1997 to 1999 she was vice-chairwoman of the arbitration and dispute resolution committee, the first woman from the Middle East to serve in this capacity. Her pioneering role in the legal sphere has been coupled more recently with prestigious diplomatic assignments as her country's Ambassador to France, from 2000 to 2004, and as non-resident Ambassador to Belgium, Switzerland and Spain. Over the same period she was the Kingdom's permanent representative to the United Nations Educational, Scientific and Cultural Organization (UNESCO). She also was a member of the World Intellectual Property Organization's Arbitration Centre Consultative Committee and became Bahrain's representative on the International Court of Arbitration of the International Chamber of Commerce, an appointment that she still holds today. A champion of women's rights, particularly in the legal sphere, Sheikha Haya has been an active participant in the movement to elevate the position of women in Bahrain before the Islamic sharia courts and is an advocate of a progressive interpretation of Islamic texts as they apply to women. She was a vice-president of the Bahrain Bar Society as well as a member of the Supreme Council of Culture, Art and Literature, and is currently a member of her country's Child Development Society and the Arab Women's Legal Network. She is only the third woman to serve as President of the United Nations General Assembly, and the first since the twenty-fourth session in 1969. 2005 NEWS ARTICLE RE UN DECADE OF CONTACT. On December 16, 2005, a Resolution to establish a United Nations Decade of Contact was formally transmitted to the incoming President of the General Assembly, H.E. Jan Eliasson of Sweden by a group of Non-Governmental Organizations, including the U.S.-based Disclosure Project, the Campaign for Cooperation in Space, and the Toronto Exopolitics Symposium. U.N. General Assembly President Eliasson was Sweden's Ambassador to the United States from 2000 to 2005. Dr. Steven Greer, Director of the Disclosure Project, has held informal briefings on the Extraterrestrial presence with high-ranking United Nations officials. Summary: At its 87th plenary meeting, on 18 December 1978, the UN General Assembly, on the recommendation of the Special Political Committee recommended the establishment of an agency or a department of the United Nations for undertaking, co-ordinating and disseminating the results of research into unidentified flying objects and related phenomena. "1. The General Assembly has taken note of the statements made, and draft resolutions submitted, by Grenada at the thirty-second and thirty-third sessions of the General Assembly regarding unidentified flying objects and related phenomena. unidentified flying objects, and to inform the Secretary-General of the observations, research and evaluation of such activities. "3. The General Assembly requests the Secretary-general to transmit the statements of the delegation of Grenada and the relevant documentation to the Committee on the Peaceful Uses of Outer Space, so that it may consider them at its session in 1979. "4. The Committee on the Peaceful Uses of Outer Space will permit Grenada, upon its request, to present its views to the Committee at its session in 1979. the committee's deliberation will be included in its report which will be considered by the General Assembly at its thirty-fourth session." paid increasing attention to the need to protect the environment, including the space environment. The work of the United Nations relating to space activities and the environment focuses on the promotion of international cooperation in the use of space technology for monitoring the terrestrial environmental; and working to ensure that space activities do not themselves cause damage to the space or Earth environment. space programmes, including Brazil, China and India, are playing an increasingly active role in the international policy debates, in particular with respect to the space and Earth environments. and protecting the terrestrial environment fall mainly into this category. The United Nations monitoring role has focused on education and training for developing countries. The Office for Outer Space Affairs, through its Programme on Space Applications, organizes short seminars, workshops and training courses and arranges for fellowships for long-term education through institutions in countries with advanced facilities. Since its inception in 1970, this Programme has concentrated its efforts on Remote Sensing of the Earth, Life Sciences, Space Transportation Systems, Planetary Exploration, and Astronomy. The fields of planetary exploration and astronomy are commonly subsumed under the term Basic Space Science. Please note below an article written by Leonard David of Space.com on May 9, 2001, after interviewing both Dr. Steven Greer of the Disclosure Project and Alfred Webre of the Institute for Cooperation in Space (ICIS). The Space.com article is clearly marked: "DO NOT PUBLISH." Though completed by Leonard David, the May 9 2001 article was blocked from publication by Space.com. Why? For what reasons and under what criteria? The 2001 Space.com (unpublished) article provides a more balanced perspective on the probable Extraterrestrial/ Ultradimensional origin of some portion of the UFO phenomenon than does the above June 22, 2006 Space.com article, which could be classified as artful disinformation by omission of UFO research with which Mr. Leonard is well familiar. The 2001 Leonard David article, though completed by David, does not appear to have ever been actually published by Space.com. The non-publication of the May 9, 2001 Space.com article, and the disinformation-by-omission nature of the June 22, 2006 Space.com article together provide an objective basis for concluding that a systematic, intentional bias exists on the part of Space.com in its reporting on the UFO Phenomenon in general, including the Extraterrestrial/ Ultradimensional origin of some portion of the UFO phenomenon. It is reasonably to surmise that Space.com (which has also published articles by Dr. Carol Rosin and Alfred Webre proposing the Space Preservation Treaty's ban on all space-based weapons) may be acting in support of the information embargo about an Extraterrestrial presence on Earth. WASHINGTON -- There is compelling evidence that Unidentified Flying Objects (UFOs) visit the friendly skies of Earth. These extraterrestrial visitations suggest the presence of advanced extraterrestrial life forms, making use of advanced energy and propulsion technology. Witnesses throughout the world and spanning every branch of the armed services are coming forward to attest to this fact and demand that the U.S. Congress take up the issue. The Disclosure Project, a nonprofit research organization, today called upon the U.S. President and Congress to support open congressional hearings on the matter. These testimonies establish once and for all that we are not alone. Technologies related to extraterrestrial phenomena are capable of providing solutions to the global energy crisis, and other environmental and security challenges. For dozens of tight-lipped officials, many who are sworn to secrecy, the group is asking for amnesty so these individuals can inform the public-at-large regarding decades of high-level secrecy about UFOs and extraterrestrials. According to the Disclosure Project head, Steven Greer, witnesses from such groups as the Federal Aviation Administration, Air Force Intelligence, the Central Intelligence Agency (CIA) and the National Reconnaissance Office are ready to step forward and make the best case yet that there is an extraterrestrial presence. "These testimonies establish once and for all that we are not alone," Greer said. "Technologies related to extraterrestrial phenomena are capable of providing solutions to the global energy crisis, and other environmental and security challenges," he said. Greer said the Crozet, Virginia-based Disclosure Project has gleaned some 120 hours of digital video testimony from witnesses regarding a long-standing cover-up, as well as amassing around 1200 pages of testimony transcript. While the data collected speaks for itself, Greer called upon the public to "demand that Congress and the President and the leaders of other countries hold hearings into this subject without delay." Greer said the only previously held congressional hearings were conducted in 1968, by the House Science and Astronautics Committee in the 90th Congress. The testimony of first-hand witnesses, thousands of government documents, hundreds of photographs, and evidence to show past landings have been amassed by the group. The materials collected will be made available for any serious scientific or congressional inquiry, Greer said. According to Alfred Webre, the congressional coordinator for the group, there are several lawmakers who have seen the legislative platform of the Disclosure Project and are prepared to sponsor it within the halls of the U.S. Congress. He would not identify those individuals, telling SPACE.com that private meetings are now underway to gain broad support for the group's findings and recommendations. "The issue is why are they here, and what institutional interface can we build with extraterrestrial civilizations," Webre said in a phone interview, from his Vancouver, Canada office. "All indications are that we are a lower-order, intelligent species. So my focus has been on the institutional aspectsto very rationally and proactively build an institutional base outward. Right now, we have an outmoded and antiquated 50-year policy of official denial that nobody now believes. At the same time, the necessary work to build the institutional infrastructure to deal with the presence of UFOs and extraterrestrials is not happening," Webre said. "We are talking about a new space policy and paradigm if you assume that the universe may be populated and regulated," Webre said. He said the group is hopeful of motivating Congress to hold hearings on their findings perhaps as early as this year, or in 2002, he said. Today, Greer said, that the evidence and testimony point to the fact that Earth is indeed being visited by advanced extraterrestrial civilizations and has been for some time. Moreover, this fact is the most classified-compartmented program within the U.S. and many other countries. Advanced spacecraft of extraterrestrial origin have been downed, retrieved and studied since at least the 1940s, and possibly as early as the 1930s. Greer said that by studying an ET craft, new breakthroughs in energy generation and propulsion have been made. In fact, classified, above top-secret projects possess fully operational anti-gravity propulsion devices and new energy generation systems. If these energy sources are declassified, he said, civilization could be empowered and free of environmental damage. Among a number of recommended steps to incorporate the science behind UFOs, the President of the United States should create a new scientific research organization. This group would be charted to integrate the knowledge and technologies behind UFOs with mainstream scientific and academic institutions. There was no follow-up then in the U.S. Congress or in the White House for Disclosure. Query: What is the follow-up for Disclosure in the USA now? ASK, WRITE, CALL THE 2008 U.S. PRESIDENTIAL CANDIDATES NOW. Contact the presidential candidates and ask them what they would do about secrecy and Disclosure! Go to their town meetings and rallies, write or fax letters, email, or call them! Thanks very much to Eric T. for calling the candidates and for getting us the contact information! Please email [email protected] if you find other helpful links. NOTE: * - Candidate has made some past statements - or refused to comment publicly - on her/his position on Extraterrestrial Disclosure. GLOBE & MAIL : Could sly little green men be the top-secret solution to our climate conundrum? We have heard so much about "thinking outside the box" that we cringe every time someone uses the expression. But how about "thinking outside the planet?" This is the message 83-year-old Paul Hellyer brought this week to the Ottawa Citizen, claiming that the salvation of Earth may lie in the hands of those who, well, may not even have hands. . . .
Whatever, the former federal cabinet minister -- who ran unsuccessfully for the leadership of both major national parties before forming his own party -- has for some time been an open believer in such matters as extraterrestrials and unidentified flying objects and flying saucers. He now says the advanced technology that allows for these alien visitors to drop in on Earth every now and then is what could, ultimately, "save our planet" from the almost certain destruction coming from global warming. What he is demanding is full public disclosure of all technical knowledge gathered during covered-up visits and UFO crashes -- the most famous of which allegedly took place in Roswell, N.M., in 1947. Herein, he believes, lies the secret to a viable alternative to fossil fuels. Hellyer may well be on to something. The intellectuals and cultural snobs among us who never missed an episode of Married with Children will recall that Al Bundy once caught three little green aliens sneaking into his bedroom to steal his dirty socks. No one believed him, of course, but it turned out that the aliens had come from the distant planet Philydion and that Al Bundy's stinking socks were chock full of mizzoozzoo -- "fuel" in the Philydion language. But Paul Hellyer isn't after a laugh track. He's completely serious about this. The former defence minister -- the man who brought unification to the armed forces -- wants governments and military from around this troubled world to "come clean on what they know." And they must, surely, know something. Spacecraft have been sighted in North American air space at least since Oct. 12, 1796, the day Simeon Perkins noted in his diary that 15 strange ships had been seen floating above the Bay of Fundy. Each year, hundreds of sightings are reported in Canada alone, and, according to some polls, more than half of Canadians believe that Earth has been visited by extraterrestrials at some time. And they didn't get here by paddling. "Climate change is the No. 1 problem facing the world today," Hellyer told the paper. "I'm not discouraging anyone from being green conscious, but I would like to see what technology there might be that could eliminate the burning of fossil fuels within a generation . . . that could be a way to save our planet." That new fuel source, he speculates, could be whatever it is that propels spaceships from one solar system to the other. He certainly doesn't think it would be Al Bundy's dirty socks, but it must be something. Hellyer believes there is now undeniable evidence that alien visitors have come to Earth -- a new documentary called Fastwalkers argues precisely this point -- and various governments are almost certain to have had an opportunity to study some of this evidence and figure out how they managed to travel so far, so fast, so cheaply. "Some of us suspect they know quite a lot," he said. "And it might be enough to save our planet if applied quickly enough." It is rather an easy thing to make fun of such thinking, but it just may turn out there is a space connection to a future solution -- if, in fact, one is available. The United States declared at the start of the 1960s that it would put a man on the moon before the decade was out, and did so. The moon mission, like the Manhattan Project that produced the atomic bomb, proved that if there is enough determination, and enough money, things that seem impossible can be made possible. It may also be that the answer lies not in some spaceship making its way to Earth from the distant planet of Philydion, but in a bus crawling across Canada these days and scheduled to reach Ottawa tomorrow. David Suzuki isn't alien -- though he's certainly been painted far worse along his month-long journey -- but he is offering solutions that have nothing to do with dirty socks or guesswork from a purported 1947 crash in the desert. His "If you were prime minister . . . " tour is all about getting people involved. He believes, as so many of us do, that the politicians are running well behind the people on the issue of global warming and what to do about it. "Frankly," Suzuki wrote in a column this week, "some of the 10-year-olds are better able to articulate what a low-carbon future would look like than most politicians in the House can muster." There are answers out there, Suzuki says, but they won't come from outer space. They are found in inner space. Inside each and every one of us.